"Be brief of speech and long on action." Profile: Pointblank knows the horrors of war all too well. He's fought in one for millions of years. Whatever romance or glory it once held for him has long since vanished... as has the cheerful adventurer he once was. Today, Pointblank is a somber, no-nonsense soldier whose every utterance creaks with weariness. 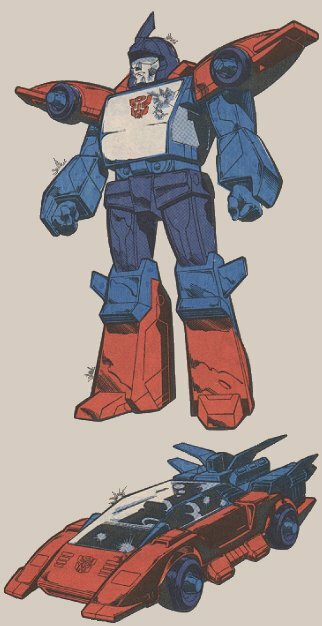 He joined Fortress Maximus's recent expedition to the planet Nebulos hoping to find peace. Instead, the war followed him and his fellow Autobots to their sanctuary. Pointblank came to the bitter realization that he could not hope to escape the war, he could only help to end it. Now he fights on, more determined than ever to defeat the Decepticons... and more convinced that an end to the war is nowhere in sight. But he's fairly quiet about his pessimistic outlook. "Words are what got us into this mess in the first place," he grumbles. "They do more harm than weapons." Pointblank's disposition improved a bit when he was paired with Peacemaker, a Nebulan law enforcement officer whose optimistic attitude is almost contagious. But so far Pointblank has displayed immunity to the Nebulan's best efforts to cheer him. Pointblank appreciates the attempt, but disapproves of the source. Although he understands the reasons behind the Autobot-Nebulan alliance, he does not accept them. The thought of spreading the war to another planet and people is anathema to the dour Autobot. Despite this, Peacemaker enjoys the challenge of loosening up his partner. He is a very patient man who believes that a positive outlook ultimately leads to success. And, as the partner of the sullen Pointblank, he's learned that patience is more than a virtue... it's a necessity. Abilities: Peacemaker is bio-engineered to transform into a stereophonic sonic blaster. His maximum power output is an audio module-shattering 160 decibels, enough to splinter a cubic yard of solid steel into shrapnel. Pointblank can transform into a rocket-powered ground vehicle, with a maximum speed of 320 mph and a range of 800 miles. In both robot and vehicle modes, Pointblank can wield weapon mode Peacemaker. Weaknesses: Pointblank is prone to tire blow outs at high speeds in vehicle mode. In weapon mode, Peacemaker sometimes comes loose from his moorings on vehicle mode Pointblank.